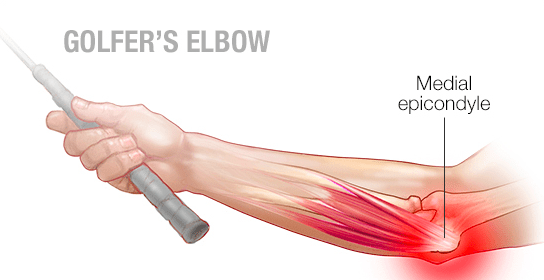 Elbow pain is frequently seen in those who are active tennis, golf or baseball players. 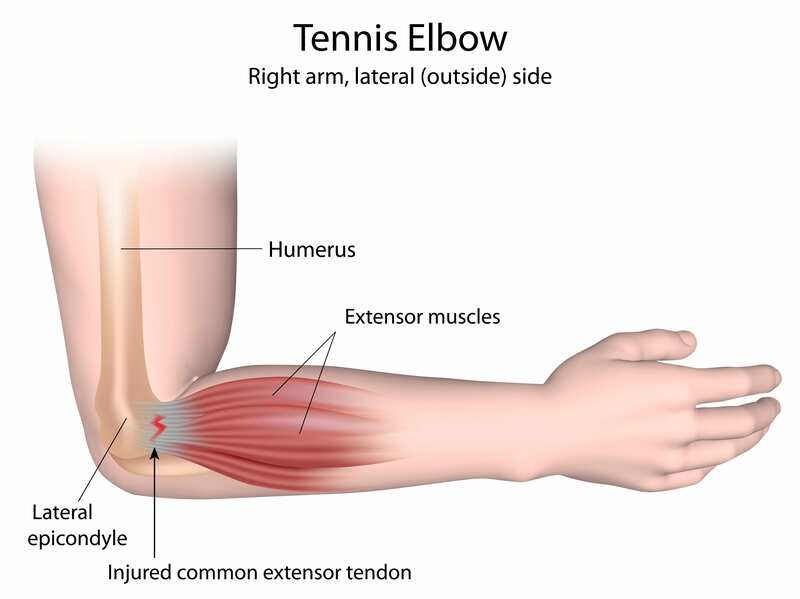 Repetitive motion of the wrist and arm for these activities can lead to tendon strain, microscopic tears and persistent inflammation of the tendons that link the forearm muscles to the bony part of the elbow called epicondyle. Osteoarthritis is another common condition that can cause chronic elbow pain and inflammation. Many individuals suffering from elbow pain due to these common injuries may be excellent candidates for regenerative cell therapy. 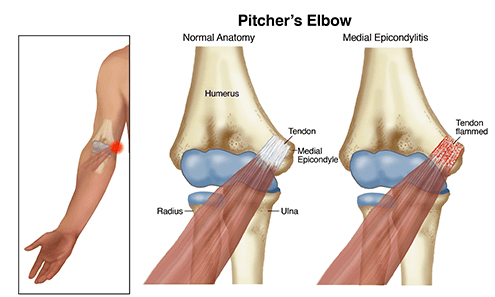 Baseball pitchers frequently suffer from an over-use elbow injury and require Ulnar Collateral Ligament Reconstruction (commonly called Tommy John Surgery). Many professional pitchers are avoiding this invasive surgery using stem cell therapy. Osteoarthritis of the elbow is a gradual wearing of the articular cartilage that leads to pain and stiffness. The risk of developing osteoarthritis in the elbow increases with age, but can also occur after an injury, such as a fracture or overuse. At times, it is simply due to hereditary traits. Aside from pain, a limited range of motion while trying to move the arm can also be a sign of osteoarthritis, accompanied by a clicking/creaking noise. Treating mild to moderate osteoarthritis typically involves resting the elbow joint, applying hot/cold compresses to the affected area, participating in physical therapy, and taking anti-inflammatory medication, and often surgery. These options require a lengthy recovery time and pose risks such as limitation of movement, increased pain and nerve damage. In this situation, your physician may consider stem cell therapy as a less-traumatic treatment option. BennuLife is at the front edge of regenerative medicine to provide patients with therapeutic treatments that use their own body’s adult stem cells to boost their own body’s restorative functions, helping the management of chronic pain, reducing or eliminating need for medications or other treatments, and allow people to return to or continue to have a healthy, active lifestyle. There is established clinical data supporting the use of either a preparation made from your own blood (called Platelet Rich Plasma, PRP) or bone marrow (Bone Marrow Concentrate, BMC) in order to treat the tendonitis related over-use injuries. The typical initial conservative treatment for elbow pain is to rest the arm and take over-the-counter pain medications like ibuprofen, to allow the body to heal. More involved treatment options for severe cases range from steroid injections, tendon debridement, and surgical release. However, our research and experience demonstrates that stem cell therapy offers a natural way of healing the elbow. Regenerative therapy may help you avoid invasive surgical procedures and get you out of pain and active sooner. A therapeutic injection made from your own blood or bone marrow, is placed at the site of injury to boost and support your body’s natural healing process. This can make a significant difference and lead to healing without need of more invasive interventions. With minimal downtime, you will be able to be back to sports quickly!